I've finally managed to publish 3rd edition rules. You can find them in download section. I've just published the latest "Downloadable FAQ" provided by Michael Dippel. Michael updated the vassal module too (version 3.3)!!! Recently Michael and Guillaume updated some of their scenarios. Michael has refreshed Vassal extension too. many thanks to Michael Dippel who updated Vassal game module (and extension) to V3.2, fixing some main module issues. You can find the main module and fanscenario extension in Download section. Michael just sent me an updated version of "Printable FAQs" (v 1.3). Thank you Michael for sharing it! Many thanks to Brad for uploading this file. 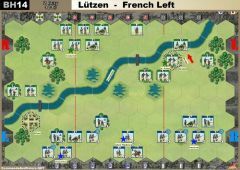 This is a compilation document created using sources from C&C Napoleonics website that puts all rules and a few clarifications not in the main rulebooks into a handy reference. I hope you will find usefulness in it. finally I've updated some "missing" scenarios submitted by fan users. You should find them on top left box called "Latest Maps". Many thanks to Michael for sending me scenario pictures and obviously to Mark and Donoug for sharing their scenarios! P.S. Donogh McCarthy is a "new scenario Designer"! WELCOME! many thanks to Michael Dippel who updated Vassal game module (and extension) to V3, adding new materials. You can find the main module and extension in Download section. thanks to Michael I've finally manged to publish all scenarios from Expansions#5. Next step will be trying to fix unit/terrain counts. Michael is also preparing Vassal game module update. Stay tuned and enjoy playing! 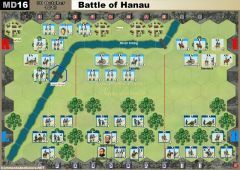 Next you will also find the complete scenario list with all scenarios from CCN Exp#5 Generals, Marshals & Tacticians. Some card preview from GMT website. Welcome to all Commands & Colors: Napoleonics fans!!! 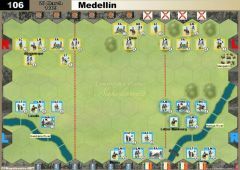 Some times ago I've read some thread over BGG talking about "missing CCNapoleonics.net" (after the satisfactions around CCAncients.net). I've thought about it and after receiving permissions directly from GMT Games I've decided to create the CCAncients.net "brother". As previously suggested in BGG threads I've decided to keep them separate (so CCAncients.net users will have to register again over here, sorry!) but Ive kept most of the features like Downloads, Scenario Results, Forum, Rules, ecc... trying to improve them. I'm completely open to add new features or better ones, so don't hesitate to write them down in the forum. Hope you like and enjoy it as we all did on CCAncients.net website. Michael Dippel released a new version of his unofficial module containing modified card deck for both Epic and Breakthrough scenarios (thanks to Chris Roper for producing the cards). Read more to find some previews (map and cards) and also direct download link. Private Messaging System, to send "fast messages" to other users (online/offline). Added Birthdays notification inside Forum (don't forget to update your profile). Recently played scenarios shown in the homepage (right column). Scenarios rating system, 1 star = very poor, 5 stars = very good). Vassal user guide (to help user download/install module and extensions). Units List, to group units information (suggestions HERE, example HERE). Every help will be really appreciated. After receiving permission directly form GMT Games I've published following materials. We hope that you enjoy them as usual. yesterday Bayernkini updated his "unofficial vassal module" and extension. the color is black on white, so you can also read it better. Thank you Michael for this grat update. Moreover Phill discovered online a website with 2 fan made scenario by Walter O'Hara. I've asked for permission to publish them so... here they are! Thank you everbody for supporting the website that way! Moreover you will also find a complete scenario list HERE, with all 18 scenarios from Exp#1 The Spanish Army. I've just published 2 new scenarios by Walter O'Hara. VSAV files to play online using Vassal are available in Download section. Thank you Walt for sharing this. some days ago Bayernkini updated his "unofficial vassal module" (v 2.1) and extension (v 1.72). Thank you Michael for this great update. Michael also spotted an error in 101 Bailén (19 July 1808) scenario image, so I've fixed it. 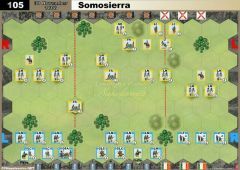 Moreover I've published his latest epic scenario: MD06 Talavera EPIC (28 July 1809). this one to let you know that Variants section is finally open!!! I've just published first House Rule article from Bill Ray and Mike Oliver (you can find it HERE). Don't forget to publish your comments and suggestions about this one in the linked forum. Hi, here you'll find a couple new scenarios! Thank you both for these submissions and please don't stop creating new scenarios!!! in the past week I've updated all scenario map pictures with new unit graphics from "unofficial vassal module"! Many thanks to Michael Dippel for helping me out on this! Moreover you'll find one more scenario from Patrick Matthews (his scenario are available in Download section). I'm also updating Exp#1 scenario pages with "unit count", stay tuned! I've just published 2 more scenarios from Patrick Matthews. You can download VSAV files in Download section to play them online using Vassal Engine. I've also completed unit count for every Exp#1 scenario! Keep up playing and sharing scenarios, results and suggestions. this one to let you know that I've just published another Variant / House Rule article from Gerard Bastiaan (you will find it HERE). it's time for some more Variant / House Rules. I've published an article from Tony French (you will find it HERE) regarding Skirmishers and Evasions. I'll take this opportunity to post my personal best wishes to you all for this Christmas. 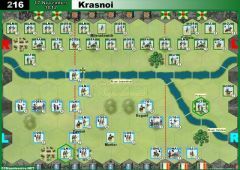 as a "new year gift" Michael (Bayernkini) completed the update for the vassal game module. The update is not compatible with old 2.1 version and also NOT to the fan "epic" expansion (this update will follow in future). You can follow the forum thread here. Best wishes for NEW YEAR 2013 to you all. In the next days you will also find the complete scenario list HERE, with all 20 scenarios from CCN Exp#2 The Russian Army. I've started to publish scenarios from Exp#2. By now I've published battles from "The Fourth Coalition". I have to fix units and terrain counts (where not set). Please be patient and I'll post all other scenarios in the following days. Many thanks to Michael for supporting me in this. I've just published some more scenarios from Exp#2 (Russian Army). 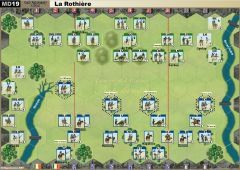 Actually you can find full battles from "French invasion of Russia". I have to fix units counts (where not set). In the meantime you can see all published scenarios from Exp#2 using this link (Expansion 2 Official Scenarios). With the last maps from "Sixth Coalition" I've complete the publication of all Exp#2 scenarios (Russian Army). I've fixed alla units and terrain count. Moreover I should have correctly TAGged all scenario, to be more "search friendly". See all scenarios from Exp#2 using this link (Expansion 2 Official Scenarios). If you find some errors, please report it into the form and I'll going to fix it ASAP. I'm really sorry for being so late during the publication process, thank you for your patience! I'm happy to announce the publication of 4 new scenarios! I should fix unit/terrain counts as soon as possible! many thanks to Michael (Bayernkini) for creating the Epic game module to be used with Vassal. You can also find a module extension with included fan scenarios (already setup and ready to be played). The Epic module is a “Stand-Alone” module (similar the CCA Epic module) with all base terrain and units. In the fanscenario extension you will find all additional winter and desert maps/terrain, special units and all setups of the existing special map size fan scenarios. You can see all scenarios from Michael HERE. Many thanks to Mr Borg for sending us some "official answers" mainly about Fieldworks rules. He also cleared out one doubt about river in Heilsbeg scenario. I'd like to thank also Michael, for updating images for 205, 206, 207 and 208 scenarios. after collecting a lot of stats in the past year about scenario playing, I've decided to publish a new webpage grouping them all. You will find the Statiscs HERE. You can also reach them clicking MAPS section (on top of the page). I hope you enjoy these ones! Thank you for your contribution (stats submission) and don't hesitate to suggest even more on the Forum. Welcome to a new scenario designer: Keith Barker! 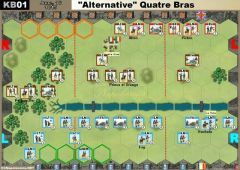 This is a modified Quatre Bras scenario that has been inspired by William Barnes Wollen's painting of the battle: Black Watch at Bay. 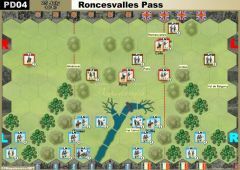 To this end the French lancers have been added and one of Picton's units upgraded to GR to represent the highlanders. 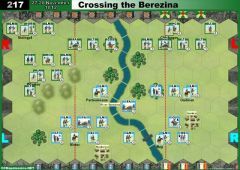 The crossroads was vital so now the French must capture it in order to win. Kellermann's Cuirassiers and Cooke's Foot Guards are no longer available at the start of the battle. You can see all scenarios from Keith HERE. many thanks to Michael (Bayernkini) for updating both Base and Epic game module to be used with Vassal. 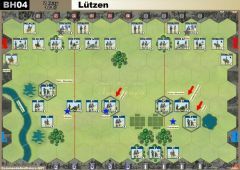 Moreover you will also find a complete scenario list HERE, with all 20 scenarios from Exp#3 The Austrian Army. Right now these websites are full with every available expansion (as to say units, scenarios, rules, faqs, online game modules). We have 564 scenarios on CCA, 107 scenarios on CCN, 20 scenarios on CCS. In the past months I've also tried to cut off some of the continuous "spam attempts" and sadly I have unwittingly created login problem to some of you... I've also managed to resolve them but I'll take this opportunity to apologize with you. Sometimes my intervention is timely, sometimes not so timely. So again, I want to Thank You for your patience. In order to keep these three webistes online and running I'm here to ask for an effort to all users with whom I shared so far this wonderful adventure that I hope will continue for a long time. Those who wish, without any obligation, could use PAYPAL form (available on right pane) and make its personal contribution. Take care and have some nice Christmas Holidays! A couple of lines to really thanks Michael Dippel and Larry Doherty who contributed again this year! I'm taking this opportunity also to introduce you the new "CCN Support Banners": they are available for each year now for all, who supports the website with a gift at least of 5 € (each year). You can see a banner preview below. Welcome to a new scenario designer: Mark McGilchrist! He submitted 4 scenarios: Battles of Brandywine Creek, Germantown and Monmouth from the Philadelphia campaign of 1777-1778 in the American War of Independence. To fit them I've also created a "special" map category called American Revolutionary War (1775–1783). You can see all scenarios from Mark HERE. 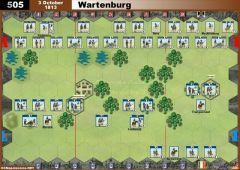 Father and son submitted 5 scenarios included in "special" map category called American Revolutionary War (1775–1783). You can see all scenarios from David and Michael HERE. in the past months I've been a little busy so I slowed down C&C website updates... but finally I've spared some time to update Units and Terrains Sections. You'll find them in the <-- Right menu under "Rules Menu". In both sections I've updated values from Spanish, Russian and Austrian expansions. Please report errors in the forum if you find any. Welcome to a new scenario designer: José Herrera! You can see all scenarios from José HERE. Welcome to a new scenario designer: András Kopcsik ! You can see all scenarios from András HERE. Welcome to a new scenario designer: Brad Hurst ! thanks to Michael I've finally manged to publish all scenarios from Expansions#4 (The Prussians). As promised... here ou can find updated Vassal module and extension! During this year I've managed to create C&C BattleCry website, to stand among other C&C websites. Over there you could find scenarios, rules, faqs and Vassal game modules all updated to latest version/revision/expansion. Sometimes my intervention is timely, sometimes not so timely. So I want to personally Thank You for your patience. Welcome to a new scenario designer: Petr Šilha ! You can see all scenarios from Petr HERE.